Over the past 13 years, the Nativity has grown substantially. From displays to performances, the Nativity just keeps getting bigger and better. Most significant, is the increase in attendance and the variety of locations that our patrons call ‘home’. While the event may be located in Carrollton, attendees come from all over the Dallas / Ft. Worth area. 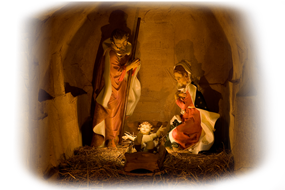 Consequently, in 2011 we changed our name to The Community Nativity Celebration. Hosted by The Church of Jesus Christ of Latter-Day Saints, the Nativity is a cooperative effort across many Christian faith-based denominations from Carrollton, Coppell, and beyond. A labor of love for so many – to bring to you and yours the true and everlasting meaning of Christmas. Year after year, families have returned to the event to experience the beauty of the Nativity and celebrate the miracle and joy of the birth of Jesus Christ again and again. The Nativity will appeal to your eyes and your ears! Hundreds of nativities from around the globe are gracefully displayed, along with complimentary art, statuary, and even a live nativity! Additionally, the Nativity includes a comprehensive choral and instrumental performance schedule, with sacred seasonal repertoires brought to you by a variety of entertaining and accomplished talent from around the Metroplex. Thousands of hours of preparation are put into the planning of the Nativity each year, culminating in a 72 hour effort by scores of volunteers. Imagine turning an all purpose gymnasium into a glorious tribute to the birth of our Savior in 72 hours! With meticulous planning, and generous donations of time and talent, this gym becomes a true gem, honoring and testifying of the birth of our Lord and Savior, Jesus Christ. See the time lapse video on YouTube here to see the Gym to Gem. We bring you this complimentary exhibit with all the love and joy that the Christmas season offers and invite you to share in this celebration of His birth again this year.